Children can have a cruel, absolute sense of justice. Children can kill a monster and feel quite proud of themselves. A girl can look at her brother and believe they’re destined to be a knight and a bard who battle evil. She can believe she’s found the thing she’s been made for. After reading DOLL BONES recently, I've decided not to expect too much from another Holly Black book. THE DARKEST PART OF THE FOREST proved itself more than the usual expectations. It turned out to be both intriguing and enjoyable. Siblings Hazel and Ben grew up in Fairfold, a strange town known for its proximity with the Faery creatures. In the woods lies a beautiful prince in a glass coffin, any day could be a chance encounter with any creature unbeknownst, and at the heart of the forest rests a monster. But except for the occasional disappearance of tourists, both humans and fae coexist, more or less, in peace… until these last fifteen years. As children, Hazel and Ben were self-sworn knights to protect their community from any dangerous fae creatures that prey on humans. While circumstances happened and Ben decided to move on from their childhood knighthood, Hazel remained to yearn for the hunt. And now that dangerous things are happening in Fairfold, Hazel decided to take up the mantle once again. Children can have a cruel, absolute sense of justice…She can look at her brother and believe that together they’re knight and a bard who battle evil, who might someday find and fight even the monster at the heart of the forest. 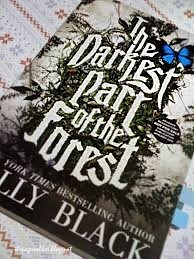 THE DARKEST PART OF THE FOREST is beautifully written. The excitement escalates up to the last page. It was really hard to put down. The characters are distinct and binding. Ben and Hazel fit like a T and worth rooting for. Ben is quiet and passionate, while Hazel is impulsive and extremely loyal. In spite of their absentee parents and strange upbringing, they have unwavering sibling devotion, steadfast love for each other. Once again, I commend Ms. Black for establishing functional family relationships in her stories. I recommend this intriguing page-turner. I’m sure you’ll love the characters, the suspense, and the well-played revelation near the end. *Thank you Little, Brown and Company for sending a copy in exchange for an honest review.